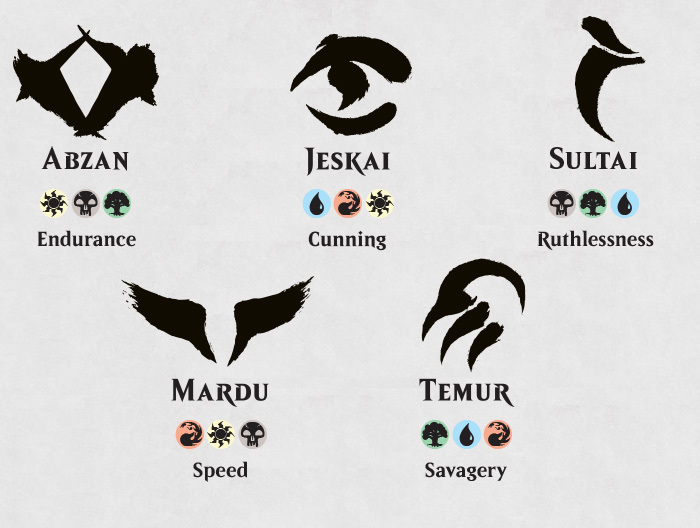 Welcome to the first week of Khans of Tarkir previews. This week and next, I'm going to tell the story of the set's design, as well as show off a couple preview cards. There's a lot of story to tell, so I'm not going to waste any more time and just jump right into it. One of the things that's important to me as head designer when I start a block's design is to always find a new place to start the design from. I've talked numerous times about how the human brain tends to use the same neural pathways to solve familiar problems and that, if you keep attacking your problem from the same vantage point, you will come up with similar answers. By always starting from a unique vantage point, I guarantee that I get my brain to tackle the problem with a new set of neurons, leading me to places we've never been before. In this draft structure, the middle set is drafted with the first set and then later in the block is drafted with the third set. "Dewey" is going to pivot and draft with each large set. This concept of a middle pivot set is where the block started its design. We've talked about doing it in the past, but it never quite fit, so during the seven-year plan, I proposed having a year inspired by a draft structure. I knew it would result in a block unlike any other. Then something interesting happened. We held the second Great Designer Search (GDS2) and ended up hiring two interns—winner Ethan Fleischer and 2nd-place finisher Shawn Main. We were interested at the time in finding more designers who were good with big-picture vision, so it's a skill we specifically tested in GDS2. Aaron and I were eager to test Ethan and Shawn's skills in this area, so I came up with a plan. The first day that Ethan and Shawn started their internship, Aaron and I pulled them aside and explained that we had a little project for them. We walked them through the draft structure for Khans of Tarkir block and explained that we wanted them to come up with a block plan that explained the draft structure. In short, why was the middle set drafted with each large set but the two large sets were never drafted together? A quick aside. Why was this draft structure so important that we had to build a block around it? It wasn't. The reason I was interested in starting with the draft structure is that I believed the answers we found would end up with us creating something unlike anything we had done before. My interest was with us starting somewhere brand new, not necessarily starting with this particular draft structure. Khans of Tarkir design was a year off, so we had some time for Ethan and Shawn to experiment and find solutions. This process ended up being so successful that it evolved into what we now call exploratory design (also known as pre-design or advanced design or advanced planning). As I explained in the advanced planning article, the way exploratory design works is that I give the team a goal (usually a sub-goal of the meta goal of solving the block structure) to work on, and each week the team shows me its latest attempts, I give notes and ask for a new sub-goal, and the iteration continues. Ethan and Shawn (along with a handful of other R&D members they got to help them) went through a series of ideas. What if the first and last sets were different places and the middle set was the vehicle, like say a ship, that got them between the two? What if the first and last set were different worlds in conflict and the middle set was where they came together to fight? What if the first and last set were the same place but set many years apart? Ethan and Shawn came up with various ideas. With each one, I then challenged them to figure out what the block would look like if it were true. After exploring many different ideas, we finally came to one that seemed perfect—time travel. It explained why the block worked the way it did, but even better, it gave each set a strong identity and created a unique relationship between each combination of sets. But knowing the block was a time travel story was only the first step. Another aside. This block is one of those blocks where I can't explain everything until the whole block is known, so there are pieces of Khans of Tarkir design I will be skipping over in this article that I will come back to when discussing the design of other sets in this block. To create the story we were interested in telling, the first thing we needed was a world in turmoil. So we went to the creative team and asked if they had an idea for a plane that was, well, not in such good shape. They said they did. In fact, it was a plane we had visited in Planechase (2012 Edition). The card was Kharasha Foothills and the plane was called Mongseng. It was a plane filled with battling warlords. 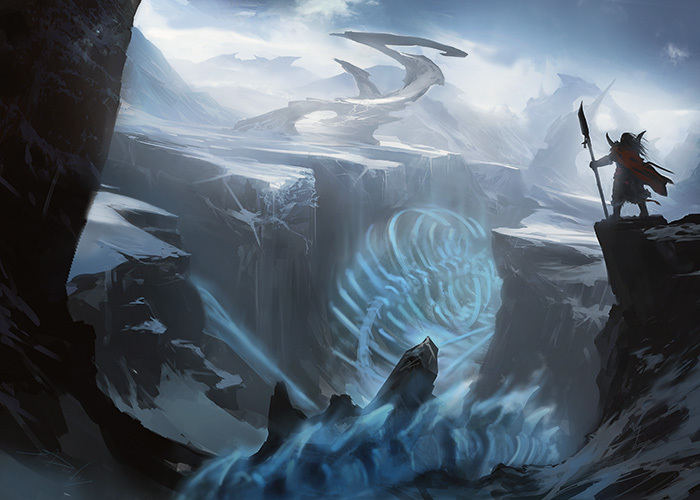 The creative team also had the idea that this world was the home of one of the Planeswalkers, Sarkhan Vol. In the end, the decision was made not to call it Mongseng (something similar had happened during Theros design with the Planechase card Lethe Lake from the plane of Arkhos) but other than a name change, the basic concept of the plane stayed constant. If you're familiar with the backstory of Sarkhan Vol, you know that he comes from a world once filled with mighty dragons that had long ago been killed off. Sarkhan was somewhat obsessed with dragons and when he planeswalked for the first time, he managed to see dragons live in the flesh. Tarkir is now a world overrun by warlords, called khans, who have turned Sarkhan's home plane into one giant battlefield. This world fit perfectly into the larger needs of the time-travel story. The first set, though, was about meeting the world of Tarkir and the current inhabitants of it. Could I build the set around a four-faction model? The first thing I wanted us to tackle was to figure out how the clans tied together. It was important to me to have a means to parallel the clans. I really wanted them to have a structure that we could then put through the lens creative had given for us for each clan. What this meant was that the clans had to be unified in some way. The thing that kept popping up was the last thing I mentioned above. I knew I needed the dragons to impact the world, even though all of the dragons were extinct. It was important that the presence of the dragons from the past was relevant. And then it hit me. What if the identity of the clans was somehow tied to the dragons? 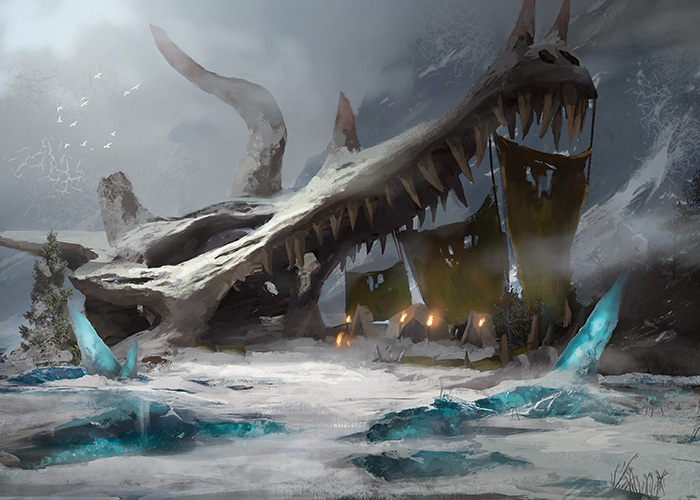 The questions I asked the design team were "How could a clan be inspired by the dragons?" "What about them could be relevant to how the clans were created?" The answer ended up being straightforward. What if each clan revered a different aspect of the dragon? What if its entire philosophy was based on the idea that some aspect of the dragon was the key to success? We started writing down aspects of the dragons that might be key to victory. The clans, after all, were run by warlords and were fighting, so the idea of building them around the means to win in combat seemed right. The first thing we wrote up on the board was "speed." What if one clan believed that the key to victory was just being faster than your opponent? How do you win a fight? By ending it before your opponent can start. The next thing we wrote was "strength." What if one clan believed the key to winning is to just be the strongest? How do you win a fight? By having the largest, toughest, meanest fighters. What did speed matter if you had the stronger army? The next thing we wrote up was "intelligence." What if one clan believed the key to victory was being smarter than your opponent? How do you win a fight? By outthinking your opponent. What did speed and strength matter if you could make the fight play out the way you planned it? The fourth attribute we wrote up was "endurance." What if one clan believed that the key to victory was being the last one standing? How do you win a fight? By taking everything your opponent throws at you and not buckling? Speed, strength, and intelligence mean nothing if you can't be beaten. We had our four factions and our four dragon attributes. We looked at our factions and looked to see if we could match them up. The nomadic clan seemed to value speed. The spiritual clan seemed to value intelligence. The other two clans both felt like they could fit strength or endurance. We ended up deciding to make the desert clan the one that was more about endurance and make the tundra clan the one about strength. The next big problem to solve was how we were going to divide up colors. Obviously, we didn't want every clan to be in every color. Was there a way to have four clans and have an even divide? The math said yes but only if two clans were two-color and two were three-color. Here was the thought process is trying to assign colors. Speed: This clan had to be red and then could be either white and/or black. Strength: This clan had to be green and then probably wanted to be red. If it had a third color, it could be maybe blue or black, but definitely not white. Intelligence: This had to be blue and then white and/or black. Endurance: This had to be white and then green. Third color could be blue or black. Okay, we had our four factions. Each one had a dragon attribute. Each one had a color combination. We were good to go. That's when Brady came back. It turns out that the creative team came up with an idea for a fifth clan. A sneaky clan that lived in the jungle and was willing to do whatever it took to win. Could we make five clans work? One of the things you learn to accept in design is disruption. As you put your set together and other sections of the company get involved, there are always requests. I try hard whenever possible to adapt and work in whatever is needed to make the set and/or block the best it can be. The creative team wanted a fifth faction? Okay, we were going to try and make it work. Meanwhile, once a week I have a one-on-one meeting with Aaron Forsythe (my boss). Aaron always asks about the current set I'm working on and asks me the kinds of things the director of Magic R&D is supposed to ask. A common question is "What's your hook?" Which means the exciting thing we're doing that makes players sit up and go, "I have to buy that." I explained the block structure and all the cool things we were doing with the design to match the story. "That's great," said Aaron, "but the payoff for that comes later in the block. What's exciting about the first set before all the time-travel stuff happens? Why do players want to buy the first set?" That question was on my mind as I set about to solve the five-faction problem. Now, the first thing that came to my mind when Brady asked for a fifth faction was this: Magic is based around the number five because the color pie, the core foundation of the game, has five colors. I was wary of creating a system of five factions that didn't somehow tie into the color pie. The pull of the color pie, I felt, was going to be too strong to avoid. Another important element to this story ties into my blog (Blogatog on Tumblr). One of the reasons I find my blog valuable is it lets me know what things the players want to see. A common request is a plane that would allow us to use the wedges. Shards of Alara had the shards, which are five three-color combinations, with each color and its two allies. The wedges are the five other three-color combinations, with each color and its two enemies. I got the wedge request so often that I started using a nickname for it (made up by one of my readers), Bizarralara (named after the Superman villain Bizarro, who is an imperfect clone of Superman). Okay, we needed five factions, the set needed a hook, I believed we had to connect the clans to the color pie, and the number one request for a new world was Bizzaralara. The choice seemed obvious—the factions wanted to be wedges. The question was, would we be able to make it work? The first thing we had to do was figure out what attribute the fifth faction represented. Well, we had speed, strength, intelligence, and endurance. If you applied those to the six attributes of Dungeons & Dragons (with speed becoming Dexterity and endurance becoming Constitution) it meant we had Wisdom and Charisma left over. How about "Charisma?" What if the final faction believed winning the fight was never getting to the part where you fought? Charm, diplomacy, bribery, blackmail—whatever won you the fight without the actual fighting part. Speed: This was the one clan that was good to go, as it was already a wedge—red-white-black. It felt like it wanted to be centered in red. Strength: If we wanted to keep red and green, that meant we had to add blue. This clan felt centered in green. Intelligence: If we wanted to keep this clan in blue-black, it meant it would have to pick up green. Green felt a little weird. Obviously, this clan was centered in blue. Endurance: Green-white-blue is a shard, Bant, so obviously something would have to change, Endurance felt centered in white so that would have to stay. Red didn't feel like a good fit for endurance, so black would have to be one of the colors. If we wanted to keep white and add black, that meant the third color was green. That's good, as green feels number two in endurance. Charisma: The way we were talking about this clan, it felt centered in black, which was good, as it was the only color not yet the center of a clan. The manipulation quality of this clan made blue a good second color. Black and blue together would mean that green would be the third color. The creative team looked at the creative make-up of each clan and signed off. They did ask for one small change. Some of the words for the dragon attributes felt off. They asked to change the name of a few of the attributes. Speed and endurance were fine. They asked to change intelligence to cunning. This made it feel a little more like a dragon attribute and like something the clan could aspire to. It also helped make red feel a little more at home. They asked to change strength to savagery. It still conveyed the sense of being bigger and badder, but once again made the attribute feel a little more like a dragon attribute. Finally, charisma was changed to ruthlessness, which better captured the feeling they were going for. It also made it sound more squarely centered in black. There was one last problem. The shards were centered around the color that had both allies. It seemed only fitting, then, that the wedges would be built around the color that had the two enemies, but as we had built the clans to match the flavor of the dragon attributes and the creative take on the clans we found that they centered not on the enemy color but one of the ally colors. Everything worked so naturally, though, we felt it was best to leave it be and not force it another way. As you will see later in the block, this decision also became important for other reasons. "I Love It When a Clan Comes Together"
We end the first part of our tale with the earliest incarnations of our clans. Next week, I'll talk about how we built them up as well as how another important element of our set, the return of the morph mechanic, came to be. But before I leave you for the day, I owe you a preview card. I have quite a saucy one to show you. In my story, I talked about how the introduction of the ruthlessness clan, aka the Sultai, threw a monkey-wrench into the design. 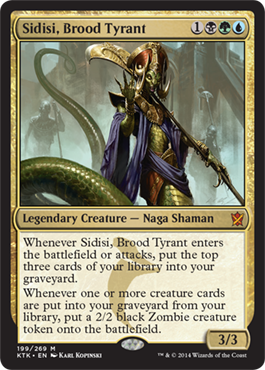 As such, it seems only apropos that I get to introduce you all to the khan who runs the Sultai, Sidisi. Click here to meet a very ruthless khan. That's all I have for today. As always, I would love any feedback through my email or any of my social media (Twitter, Tumblr, Google+, and Instagram). Join me next week for Part 2 of the story of Kahn of Tarkir's design. Until then, may you find your own inner dragon attributes. "Drive to Work #152—Unhinged, Part 5"
This week's first podcast is the fifth and final podcast in my series on the design of Unhinged. "Drive to Work #153—Who's Who: R&D, The Second Wave"
My second podcast is the second in a series about the history of the people who have made Magic. Last time I did this series, I talked about the initial wave of employees in R&D. Today, I talk about the second wave (including the hiring of little old me).